Major shippers are increasingly turning to Africa to avoid fierce competition on more traditional routes. However, as freight volumes are still too low, overcapacity is a constant problem. At first sight, maritime shipping appears to have weathered the crisis of 2008. For the first time ever, combined volumes of all types of cargo carried by the world fleet have exceeded 10 billion tons, up 2.1% on 2015. Four-fifths of goods traded worldwide are now moved by sea. These figures would have been even more impressive had international trade not remained stubbornly sluggish, with growth not expected to exceed 1.6% in 2016 – the smallest increase since the last financial depression. Against this backdrop the primary industry stakeholders – container shipping companies – are suffering not only along the highly-competitive east-west routes between Asia and Europe and on transatlantic routes, but also, much more recently, on services to Africa. This has been driven by the collapse in commodity prices over the last two years, with particularly severe consequences for the continent’s economic heavyweights, Angola and Nigeria. 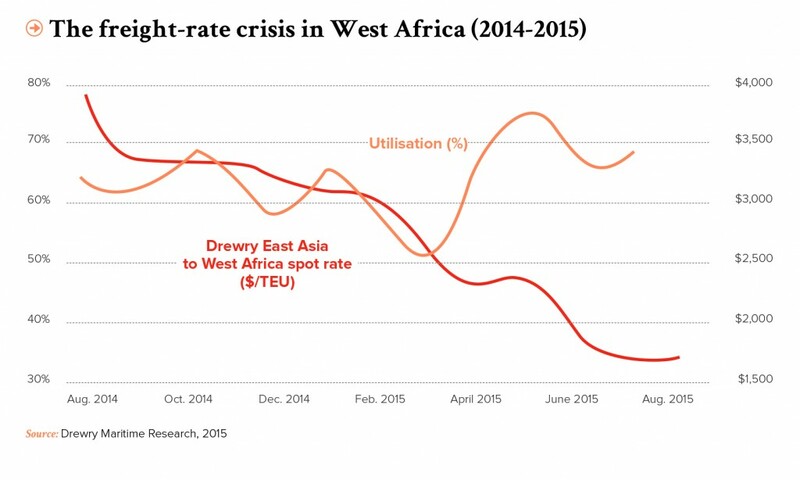 While traffic with Europe along the traditional north-south axis remains profitable with tonnages holding up, the London-based independent maritime consultancy Drewry is warning of a 19% decline in African container volumes traded with Asia for the third quarter and an overall fall “of over 10%” for 2016 – a trend that could be reversed with a recovery in market prices. At the same time, the most diversified African economies, such as Côte d’Ivoire, Ethiopia and Senegal, are expected to continue growing at over 5% and to increase their commercial trade by a similar margin. Although it is very closely linked to current economic circumstances, this decline is hitting the shipping companies hard. While Sub-Saharan Africa only accounts for 1.78 % of the world’s container traffic, the economic momentum and outlook, combined with the continent’s anticipated population explosion, appeared to offer a much brighter future. Moreover, neither the top three industry players – Denmark’s Maersk Line, France’s CMA CGM and the Italian-Swiss operator MSC – which between them carry three-quarters of all container traffic to and from Africa, nor the plethora of smaller Asian and European operators, have skimped on the capacities they are allocating to serve the continent. Faced with the collapse in freight rates due to the arrival of ever-larger vessels over the last three years, ship-owners have reduced shipping capacity in the north and transferred part of their fleet southwards to keep pace with growth, especially in Africa. At the same time, Africa is modernising and deepening its major ports to enable them to receive these “maritime behemoths”. While global transport capacity increased by 3.5% in 2016, it leapt by 46% for Africa and it is becoming increasingly common to see ships carrying 6,000 containers or more in Abidjan or Pointe Noire (Congo-Brazzaville). In 2011 Safmarine, the African subsidiary of Maersk, flexed its muscles with the introduction of its Wafmax class, capable of carrying 4,500 containers along West African coastal routes. A few years later, MSC began providing a transhipment service at Lomé using a 6,500 TEU (twenty-foot equivalent units) container ship. Today, the company is converting these into 13,000 TEU capacity ships – which is an awful lot better than scrapping them! The loss of earnings arising from these overcapacities in a time of falling prices combines with “the effect of geopolitical uncertainty”, according to Mukhisa Kituyi, Secretary-General of the United Nations Conference on Trade and Development (UNCTAD). The doubling of the Suez Canal in the fraught arena of the Middle East has pushed up insurance costs, which places a further strain on ship owners’ accounts. With Suez Canal transit fees estimated at $800,000 (around €754,000) for a container ship, many operators are looking for alternative solutions. The historic route around the Cape of Good Hope could be revived but the excessively long transit time remains a big drawback — particularly with Africa’s developing overland links (notably rail) which should eventually provide an alternative to purely maritime services. In addition to diverting some transcontinental traffic, these new arteries could ultimately divert some of the growing intra-African trade away from the coasts. The map of maritime services would then be redrawn to reflect changing trade flows between economic zones. The continent’s potential would appear to be limitless. Pending such a logistical remapping, the supply side of the African maritime sector is a long way from full capacity. Between the recurring imbalance in quantities imported and exported – exacerbated by the slowdown in economies dependent on natural resources – and the exponential increase in vessel capacities, Drewry estimates that ship loading rates “are sometimes as low as 56%”. This begs the question as to whether companies are still making money on certain ports of call. And things could get worse! Africa still has huge needs. However, at the current rate, as competition escalates between big players trying to limit their losses and a chasing pack excluded from the east-west routes due to a lack of resources, supply could well exceed demand. Fortunately, the continent’s potential would appear to be limitless. Plans for new-generation megaports in Nigeria and on the east coast in Tanzania and Kenya, could justify the development of such capacities, not to mention new currently untapped routes with the huge Indian market. The future may therefore be brighter than it seems although for Africa things are certainly not as rosy as ship-owners would believe. In any case, operators are accustomed to the vicissitudes of a sector that ebbs and flows along with the fortunes of the global economy and they have always been able to draw on the resources necessary to adapt or anticipate accordingly. Ultimately, everything comes down to capacity. Gargantuan work to widen and deepen the canal was undertaken along 37 km of its 193 km and a 35-km parallel shipping lane was added. Egypt expects traffic to double by 2023, from 49 to 97 ships daily, and waiting time has been cut from eighteen to eleven hours. Revenues should climb to $13.2 billion per annum (compared with $5.3 billion today) and as this accounts for 20% of the state budget, the extra income will help to boost Egypt’s stagnant economy. Yann Alix, Histoires courtes maritimes et portuaires, Editions EMS,May 2016.